At Arnold Jewelers we have a full in-house repair department with Master Jewelers on hand to repair, restore or rebuild any piece of jewelry you have. Whether you need a ring sized, a stone mounted in a new ring, a simple solder in a broken chain or a watch battery replaced we’ve got you covered. We also have an express service available if you need it done that day. With over 30 years of trusted service, you can feel comfortable that your jewelry is in the best hands. We also have a 90-day guarantee on all repairs. All of our jewelry repairs are done in-house by one of our Master Jewelers. Your beloved items never leave our store. Our jewelers have over 45 years combined experience, so you can rest assured your jewelry is in good hands. When you lead a busy lifestyle it can be hard to give your jewelry the TLC it needs. At Arnold Jewelers, we try to make maintaining your jewelry as simple and easy as possible. Regular service extends the life of your jewelry and prevents the loss of diamonds and gemstones. We can check the prongs that hold the diamonds and gemstones and tighten them if needed, and safely and professionally clean and polish your treasures and check clasps for wear. This service is always free for jewelry you purchased from us. *These prices are estimates based on average weights and sizes. Feel free to contact us. Our expert craftsmen and technicians will give you a cost and turn around estimate as soon as possible. 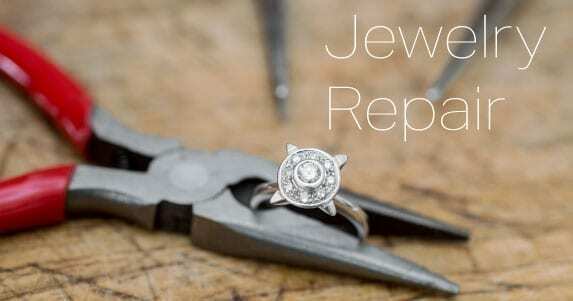 Please fill out the below contact form to get started with our jewelry repair services.